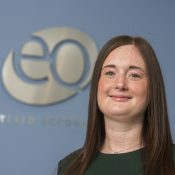 Rachel has been with EQ since 2008, having trained and qualified as both a CA and CTA while with the firm. She is now a Principal Manager in our Dundee office with a varied client portfolio, delivering many different services, with a particular focus on business tax. Rachel is head of the Transaction Tax group and also specialises in R&D Tax credits, business restructuring including incorporation, delivering capital allowances claims and remuneration planning.